Going for a long run is a great way to strengthen your cardiovascular system and get an awesome full-body workout in. And don’t let anyone tell you otherwise, running is great for burning fat and helping you get leaner. Plus, going running regularly makes your legs look FANTASTIC! But being a runner can also leave you victim to some pretty annoying and sometimes painful problems. Blisters and black toenails are two of them. Lenora loves to run but she experiences these two issues often and is finding that it’s limiting per potential as a runner. She’s also having a hard time finding good solutions to prevent these problems from happening so she can continue to train on schedule and do what she loves. 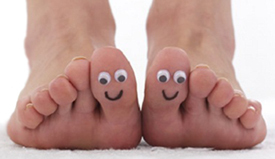 Got blisters or black toenails from running or other sports that require running? Sometimes the answer to these kinds of problems is as simple as changing what you put on your feet… but not just your shoes. Get yourself to your nearest running store and they’ll get you set up with the solutions you need.